"The Nigerian-American Council (NAC) met with Nigeria’s Independent National Elections Commission (INEC) Chairman, Prof. Attahiru Jega in Washington on Monday January 27, 2014, as guests of the Center for Strategic and International Studies (CSIS), to discuss Nigeria’s coming 2015 National Elections. The meeting featured discussions of INEC challenges in the coming elections, including, lessons learned from the Anambra elections, electoral malpractice, voter registrations and validations, logistics, training for INEC Staff, media interface, and most importantly security. Prof. Jega reiterated INEC’s preparedness to address all the above issues as Nigeria heads toward the 2015 elections. Prof. Jega outlined measures recently taken by INEC to address multiple registrations, security of voting materials, retraining of INEC Staff, media interface, and transparency in the collation of ballots and final results. The Executive Director of the Nigerian-American Council, Samuel Okey Mbonu also presented the Council’s Nigeria 2015 Elections Policy Advisory paper to Prof. Jega. The Council’s Policy Advisory paper outlined areas of potential challenge identified by the Council, and advisory policies the Council offers to ameliorate or mitigate the potential dangers. The Council also advocated for the total use of Closed Circuit video coverage and satellite monitoring of collation stations, as well as a proposal to have INEC Staff execute asset disclosure forms that are binding for five years after the elections. Prof. Jega expressed his willingness to tap into various technical and related assistance, to be provided by the Nigerian-American Council, as well as other international partners; to ensure hitch-free elections in 2015. The Council commended INEC Chairman Prof. Jega on his willingness to reason with potential technical partners, with a view to improve the outcome of the elections." The most peaceful and credible presidential election ever held in Nigeria is setting a victory for the incumbent Nigerian president Goodluck Jonathan. With the returns from 29-30 states out of 36 states of Nigerian federation, President Jonathan have garnished a majority, and 25% of the vote in each of two-thirds of of the released results including winning the federal capital territory Abuja. President Jonathan of Peoples Democratic Party (PDP) appears unstoppable with the closest challenger Rtd. General Buhari of Congress for Progressive Change (CPC)trailing behind. According Wall Street Journal, "After Saturday's polling, which saw unprecedented turnout, Mr. Jonathan had an early lead, according to results read aloud on national television by the Independent National Electoral Commission, or INEC. Mr. Jonathan had about 63% of the votes to Mr. Buhari's 28% as of late Sunday. Final results aren't expected until Monday morning. The winner will have to secure a simple majority, and 25% of the vote in each of two-thirds of Nigeria's 36 states. Failing those benchmarks, the voting could go to a runoff. But that possibility seemed unlikely after the initial tally." On the INEC declared and released results, PDP's President Jonathan won 21 states and gathered 25% in 27 states out of 36 states and thereby fulfilling the requirements for victory. 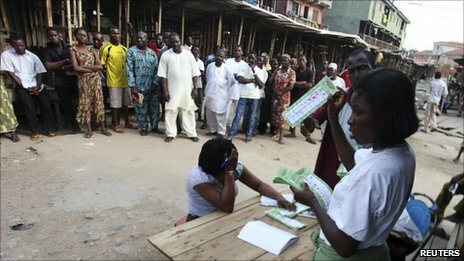 Nigerians are going to the polls for the long awaited April election. But Electoral commission chief Attahiru Jega announced on television that the first parliamentary election will be delayed until April 4 "after voting materials failed to arrive in many areas, a major blow to hopes of a break with a history of chaotic polls in Africa's most populous nation, Voters had trooped early to polling stations across the country of 150 million, eager for a ballot less tainted by fraud and violence than 2007 elections that lacked credibility in the eyes of Nigerians and international observers," as reported by Reuters. But we must hold our judgment for now, but it is not good for the long awaited election. This is no ordinary election in this West African powerhouse but rather an indicative election that will show to the whole wide world how serious Nigeria is with the emerging democratic dispensation. 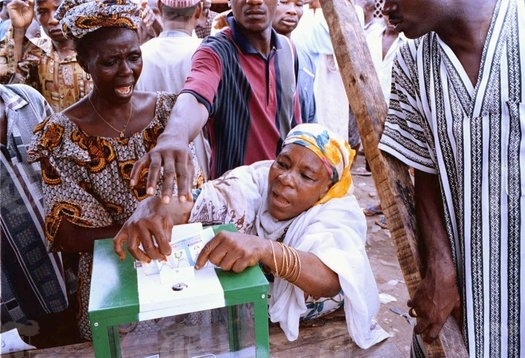 Nigeria’s last held election of 2007 according to domestic and international observers was marred with violence and irregularities that made it incredible and unacceptable. Nigerian prestige this time is on the line, the civilized world will not accept anything short of free and fair election neither will Nigerian citizens accept election irregularities as business as usual. Everything at the moment is going right for Nigeria: The economy is getting stronger; Nigeria is regaining her confidence after being away from diplomatic circle and finally playing the significant role of the giant of Africa. For Nigeria to arrive and taking her distinguish seat among the comity of nations, she must first and foremost get the election thing right this time. Let us be realistic, Nigeria is an emerging democratic nation and nobody expects to see everything work-out quickie clean. But what is expected of Nigeria is to organize and implement a free and fair election to the best of her knowledge. Of course there is no utopia in election; there maybe hiccups here and there. But the key issue is to produce a credible election results that are relatively fair and free, that majority of Nigerians can accept as a credible result. The election results must be correct with little or no mistake and should be self-evident to all the parties that the results are correct and right. A credible election outcome will not only increase Nigeria’s diplomatic standing in diplomatic circle but it will also give a brand new image to a nation that badly needs to rebrand her image. This election can become a foundation for Nigeria to build solid blocks of good reputation that can make her attractive for domestic and foreign investors. When Nigeria gets her house in order investors cannot have double mind of investing their capitals and resources for a long duration. A such ambivalence among investors can result to capital flights and divestments. In nation building and in growing an economy, political stability becomes the most paramount and imperative condiment for investors and tourists to stay put. Capitalists and investors do not put their money on nations that have weak political stability and risk losing their investments. An election is an indication that a democracy is working as it should, becoming an enabler and assurance that a nation is willing to do business. Political stability is an insurance that the risk of investing in a nation is limited and risk management is at the optimum level. For a million times we have heard the phrase that Nigeria is potentially a great nation. Now the time has come for Nigeria to actualize it, this time Nigeria cannot afford to fumble the ball and fails to score a credible goal. The merits of free and fair election are numerous including a rising diplomatic standing and ascending self-assurance. Nigeria must truly take the lead in Africa be it economically or politically because Nigeria is the natural leader of Africa. The ascendency to a truly giant of Africa must come with a substantial improvement in the democratic standing and this can be achieved by holding a credible election this time. No one is saying that democracy is all about election but in actuality election is the chief component of democracy thus buttressing the wellbeing of democracy and its political actors. Nigeria has come at a crossroad and she must make the right decision to seize the opportunity and make good of her promise. Nigeria can make this work in her country by proving to herself in particular and to friends including her foes that this is a new and improve Nigeria that is ready and willing to assume and reclaim her mantle as the largest democracy in Africa. The global village is watching and Reuters wrote recently, "The African giant, home to more people than Russia, won an unprecedented third term as chairman of West African regional bloc ECOWAS last week and sees itself as a prime contender for a permanent seat on the U.N. Security Council. But its credibility as a regional leader at a critical time, with Ivory Coast plunging back into war and the international community striving for a common voice on North Africa, hinges on the success of elections which begin　on Saturday. Polls as flawed as the last ones in 2007 -- marred by ballot stuffing and intimidation -- could easily erode the goodwill President Goodluck Jonathan has built up since inheriting power last year when his predecessor Umaru Yar'Adua died in office." Nigeria cannot afford to make the mistake of yesteryears. Terence McCulley, U.S. ambassador said, "Nigerian leadership in ECOWAS, at the African Union, and at the United Nations has been impressive and commendable, particularly with regard to the crises in Cote d'Ivoire and in Libya, The quality of these elections will certainly be important as to how the U.S. and other nations view Nigeria, and how effectively Nigeria can exercise leadership internationally," as he commented on this April election to Reuters. This is a sign that the world is rooting for Nigeria to do it right this time. Subsequently empowering and gaining more confidence comes with a credible election outcomes, as Nigeria deliberate on the issues of Ivory Coast, Libya and other hot spots in Africa. Nigerians cannot abandon the whole issue of election credibility to INEC and the government. The citizens of the country must see themselves as stakeholders in making this work for the country. The citizens can play the critical role as watch dogs, not by being forceful and violent rather by being responsible and voting without causing fracas and attracting undesirable attention. Nigeria cannot afford to mess things up for so many things are at stake: Nigeria’s prestige and future will not be thrown into the mud. Nigeria must understand that a culture of free and fair elections is not made in the sky or in stars but are made when men and women of goodwill seize the opportunity and transform their country. The culture of credible election will nurture a socialization that can be smoothly and naturally passed to the next generation and posterity. This time around we all hope that Nigeria will do it right! President Goodluck Jonathan has called on Nigerians in general and ruling Peoples Democratic Party (PDP) in particular to shun rigging of elections for him in the forthcoming presidential election. The president made the warning as he received a group of 21 leaders of civil society organisations that paid him a courtesy visit at the Presidential Villa at Aso Rock. President Goodluck Jonathan said, "I am a PDP person but if PDP is involved in violent campaigns, you have to condemn such very strongly and clearly. I have told my PDP family that nobody should rig for me. We must conduct free and fair general elections, and every vote of the electorate must count come April." He continued, "We must all collectively condemn electoral violence because if we damage the country, then we lose collectively. You must stand up against electoral violence and rigging of election irrespective of political parties." According to Daily Trust President Jonathan commented that his "government’s confidence on the integrity of members of civil society groups has been demonstrated in the appointment of two civil society advocates, Prof. Attahiru Jega as Chairman of the Independent National Electoral Commission (INEC) and Dr. Sam Amid as Chairman of the Nigerian Electricity Regulatory Commission (NERC), to oversee critical aspects of national life." Daily Trust wrote that "The President said government will continually engage civil society groups constructively to fast-track national growth and development through the Special Adviser to the President on Relations with Civil Society, Chineme Ume-Ezeoke, who was also present at the meeting." Nigerian achieving a free and fair election with little or no hiccup will boost the country's confidence and shows Nigeria's maturity, discipline and democratic ascendency. 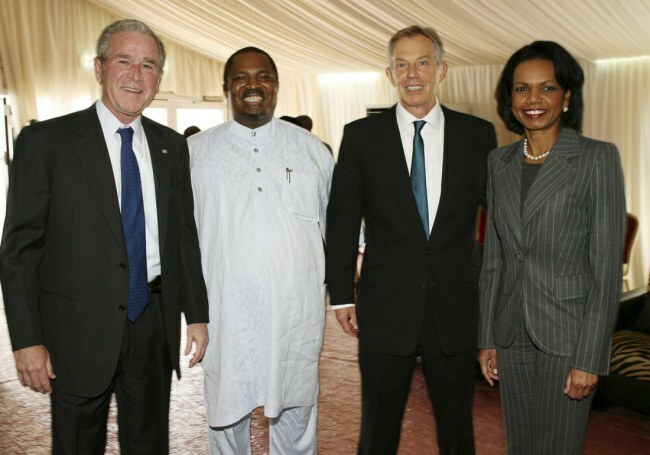 The former British Prime Minister Tony Blair was quoted recently on the concern of world community on the forthcoming Nigerian 2011 election. Mr. Tony Blair the former British prime minister and a clever politican is no stranger to African politics and Nigerian politics in particular. He said that the international community is expecting a lot from Nigeria’s general 2011elections. During his tenure in Britain he organized many out reach programs for African including the formation of task force on African debt problem. He promoted the idea of debt forgiveness and increase in foreign aid for Africa during his leadership and as a head of G8. But his initiates failed because the group of G8 responed lukewarm to the program of debt forgiveness and increased in foreign aid to Africa. Moreover, the opposing voice was that Africa needs more trade and trade concession, not more foreign aid. Many view foreign aid as corrupt - a threat to engine of development and economic progress. “The Colloquium on Africa” focusing on the forth coming elections in Nigeria summoned by the Honorable Chinua Achebe should contribute to solving the problem of voting machination in the country. Achebe must be commended for organizing an important event, mostly for his continue devotion and patriotism. Nigeria must be shepherded and guided by men and women of goodwill who knows that for Nigerian greatness to be realized, we cannot abandon the course of democracy to lethargy and cynicism. "If Nigeria's recent democratic failure passes without consequences from the international community, then the very idea of democracy in Africa is at serious risk," concluded Human Rights Watch. Honorable Achebe has done the right thing by calling the country to self-examine herself on the issues of politics, election and democracy. No one is saying that democracy is all about election but it is an integral part of a democratic process. Election is an indicative of the longevity and richness of a democracy. The Achebe’s Colloquium on Africa was held at Brown University on Dec. 11, 2009 with the focused theme, “The international Conference on Nigerian Elections” which by itself is accumulative breakthrough in making democracy works in Nigeria. The symposium was honored with notable individuals from diverse walks of life including the Nigerian Nobel laureate and social critic - Great Wole Soyinka, President of Brown University -Ruth Simmons, Governor Peter Obi of Anambra State who was the guest speaker and many others. The ramification of this December gathering on Nigerian polity will be difficult to be quantified but its awareness on the polity cannot be overemphasized. The people of Nigeria must be aware that the responsibility of governance and democracy do not rest only on the politicians but also on the voting masses. Therefore Nigerians cannot afford to be disorientated, nonchalant rather vigilant and active stakeholders in the democratic process. The noble idea of democracy as a political ideology cannot be allow to be faltering in Nigeria. Democracy has worked for so many countries and it can work in Nigeria too. One thing we must recognize it’s premature to say that democracy cannot function in Nigeria until we have given it our best. It is about making mistakes and corrections that we can build a credible democracy in Nigeria. Confidence building associated with free and fair elections will consolidate democratic process in the country. “The Colloquium on Africa” cannot be only an intellectual exercise but a pragmatic Townhall Meeting that should assemble together all the communities and organizations that are stakeholders in our great country Nigeria. The representatives of Nigerian Students Association, Nigerian Labour Congress, Market Women Association, Trade Unions and officials of Nigerian Electoral Commission should participate and play a vital role in such event for these people are at the grassroots and are closer to the action. The logistic and location for this important event must be considered. The ideal location and venue for the Colloquium on Africa should be on African soil – Nigeria. But for all practical purposes the venue at Rhode Island is a good one. The modern technology of satellite and telecommunication should be utilized to connect all the citizens of Nigeria that cannot make it to America. Chinua Achebe has given so much to Africa and indeed to the whole world. This great dialogue he initiated must be replicated in all parts of Nigeria and Africa, so that we can come together to brainstorm and strategize on the pitfalls and vulnerabilities of democracy in our hemisphere and apply credible solutions to stop the hemorrhage. African countries and Nigeria in particular can rise to the challenges of modern Democratic governance for the sake of our children and posterity. The sustainability of democracy in Nigeria rests on having a fair and free election. On election credibility a durable foundation is laid for survival of democracy in Nigeria. In the recent past, the ability of the Independent National Electoral Commission (INEC) to deliver a fresh Voter’s Register for the 2011 elections and to conduct the elections proper within the timeframe established by the Constitution and the Electoral Act 2010 has dominated discussions in official circles, the development community, the mass media and the general public. INEC is not oblivious of the genuine concerns being expressed, yet the Commission also sees these discussions as an indication of the continued public goodwill towards the Commission in this collective task of delivering free, fair and credible elections in 2011 and beyond. It has since become clear that due to a combination of legal, administrative and practical reasons, among them delays in bringing the new electoral legal framework into operation, we have missed some of these timelines by up to one month. Fortunately, the major issue of funding has been settled with the passage of the supplementary appropriation by the National Assembly and the agreement we reached with the Federal Ministry of Finance on a schedule for releasing the funds. I wish to express the appreciation of the Commission to both the Executive and Legislative arms of government for their abiding support and tireless efforts in this regard. First, it is not the Constitutional responsibility of INEC to establish or change the legal framework, including timelines for electoral activities. Consequently, to canvass change in the legal framework or Constitutional provisions on election dates would not only be inappropriate, but could open the Commission to public suspicion, given the well known recent electoral history of Nigeria. Second, the question of fixing and changing election dates has been one of the major sore points of our electoral experience in Nigeria. The degree of partisanship that usually informs discussions of these issues is legendary. Consequently, we decided as a Commission that direct involvement in such debates could undermine the independence of INEC in the eye of the public. Yet, we fully understand the position within the relevant arms of government that INEC is in the best position to indicate if it needs more time to carry out its Constitutional roles effectively. Certainly, he who wears the shoe should know exactly where it pinches and what is worth doing is worth doing well. The foregoing clearly shows the dilemma that the Commission has been grappling with in the past few weeks. At a retreat of National Commissioners and Resident Electoral Commissioners (RECs) of INEC in Calabar from September 16 – 19, 2010, these issues were exhaustively discussed, weighing all the implications for the Commission, the electoral process and the Nigerian people. That retreat resolved, among other things, to engage relevant stakeholders in consultations on this critical outstanding issue of constricting time frame. Indeed, this problem is not peculiar to INEC. As you are well aware, our consultation last week with the leadership of all the registered political parties clearly showed that it is a problem these critical players in the process also face. 1. We wish to reiterate our belief that the conduct of free, fair and credible elections is the collective charge of all Nigerians, not just INEC. 2. While we remain unflinching believers in the rule and sanctity of law, it is also clear that conducting free, fair and credible elections has become central to securing the future of Nigeria as a nation. Given that the Constitution and Electoral Act must remain sacrosanct, still there is no point in delivering an electoral process the outcome of which will again be controversial and incredible. 3. We appeal to the National Assembly, as it reconvenes from recess, to explore all possible ways within the ambit of the law to extend the time available to INEC to conduct the voter registration exercise and the 2011 elections. We also restate that should this happen, the May 29 inauguration date must remain sacrosanct. 4. 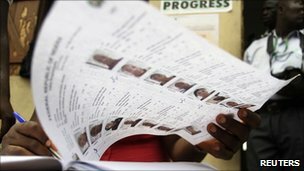 We request all stakeholders and the wider Nigerian public to support the relevant organs of government in taking appropriate steps to adjust the existing timeframe, so that INEC could give strong guarantees on delivering a flawless Voters’ Register as well as free, fair and credible elections in 2011. Specifically, it is no time for the blame game or politicization of this crucial phase of our experience as a nation. In conclusion, we, as a Commission, remain humbled by the enormous goodwill and understanding extended to us by civil society organizations, government officials, development partners, political parties, professional associations, labour organizations, the mass media and the general public in the past two months, in spite of their genuine concerns about the electoral timelines. We look forward to their continued support in the months ahead.